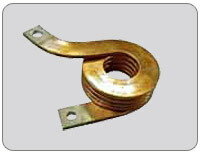 We manufacture many varieties of coils for high current applications, most notably of the edgewound variety. 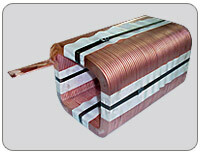 These coils range in size from a few ounces to several hundred pounds, and are constructed using copper strip .032"x.375" to .750x2.500" in cross section. With in house edgewinding equipment, hydraulic presses to 100 tons, and inert atmosphere annealing furnaces, we maintain tight control of quality and very competitive pricing. 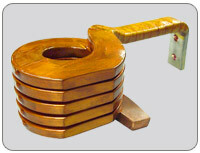 We can manufacture most any design, edgewound, or otherwise.